I am Willow and I am a WonderBull. Really, I am just a dog who gets to have a lot of fun and meet a lot of people. 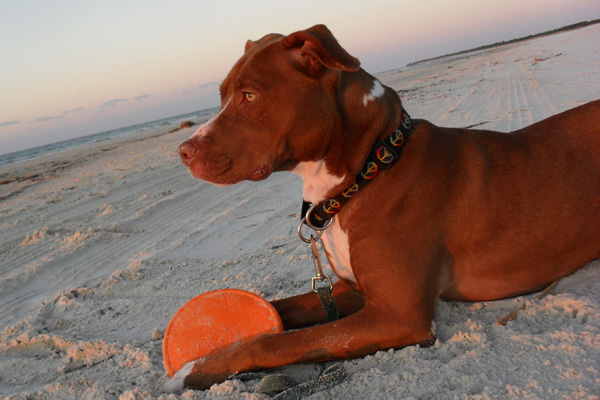 I am a pit bull, yes, you know the type … or do you? I do my best to change people’s negative perceptions about pit bulls. I was rescued from an irresponsible owner, who let his dogs have an accidental litter. The rescue took the six female puppies and paid to have mom and dad spayed and neutered. My fur parents had a reputation for being nuisances and often got out and ran the streets. The rescue did their best to educate the human owners on being responsible. After only a few days in foster care, my human moms picked me out of us six girls. I am the lucky one! When I was 11 weeks old, a woman asked if she could pet me. She thought I was a Weimaraner. When she was told I was a pit bull, she stepped back and gasped. Oh, did I mention I was sound asleep in my new mama’s arms at the time? We knew right then that I would spend most of my life defending the honor of pit bulls. And so, my training to become a pit bull ambassador began immediately. 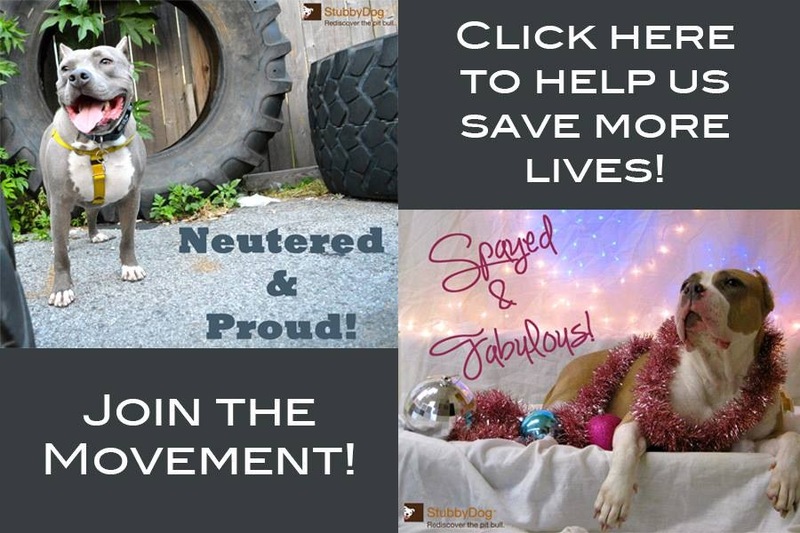 We had three main goals in being a breed ambassador: to teach by example, to promote a positive image at all times and to encourage other pit bull owners to be responsible. I started out by taking 16 weeks of basic obedience training. I went to doggy daycare one day a week to learn how to interact with other big dogs, and I have several small dogs and a couple of cats at home to interact with. I started going out to local dog events and to yappy hours. I got to go to all my favorite doggy stores and boutiques. They took me anywhere they could. “Look, sit, stay, toes down, leave it,” “gentle with the babies” and, of course, “give kisses” – these are words I hear in my sleep. But all the training and all the socializing was starting to pay off. If I “sit” at the events, I get treats; if I “look,” I get my picture taken, and if I’m “gentle with the babies,” I get to give them kisses. Educating the public has meant a wardrobe change! We noticed that as I grew, people started to veer away from me or even cross the road to stay clear. I was starting to get a complex. We had to do something to attract the people to me. So, I started dressing up in cute outfits. My Chihuahua sister Sophie gave me the idea. Chihuahuas are always dressing up. I wear T-shirts with jean shirts, headbands with big flowers, tutus and party/schwag collars. That did the trick! 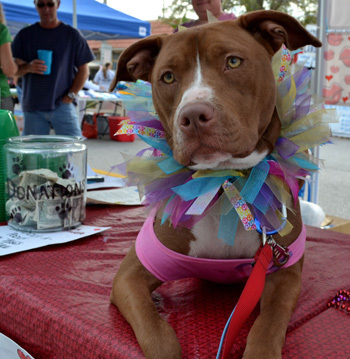 Who can resist a 60-pound pit bull in a tutu with a big flower headband? Whenever people approach, my mom tells them all the good things about me and my fellow pit bulls. My adopted sister Jade is always at my side to reinforce that it’s not just me. Jade prefers not to dress up, and it’s good for people to able to interact with her in her natural state. 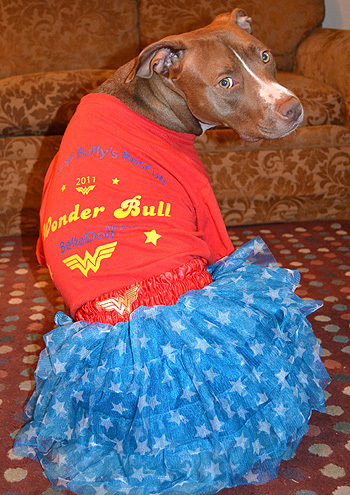 In November 2011, I was awarded the “WonderBull” award by Pit Stop Bully’s Rescue. They said they chose me because of my temperament and for positively representing the breed at the many events they saw us at – also, for the fact that I had been doling out kisses for charity most of the day. I was five days shy of my 1st birthday … what an honor! What a responsibility! It would change my life! 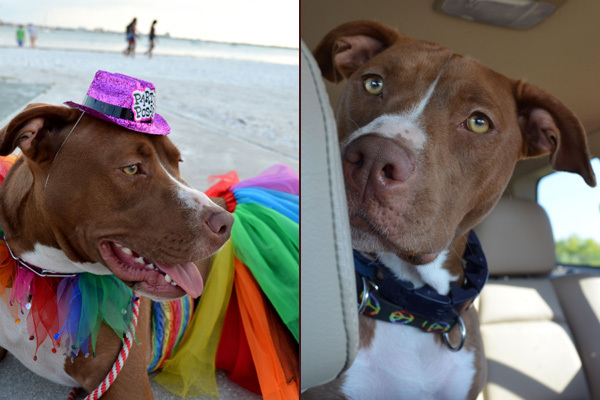 I started a Facebook page, Willow WonderBull, to document the events I went to and to keep in touch with what was going on in the world of pit bulls. Things took off from there! People started recognizing me. People wanted to talk with the moms about us, which in turn attracts more people to me. I have to be on my best behavior when I go out. I teach by example, and Mom talks to people about importance socializing and basic training, spaying and neutering, and just being responsible dog owners in general. They are there to answer questions and to network. It’s all about working together. I have nearly 600 friends that I interact with. I try to keep things positive. People hear enough negative. 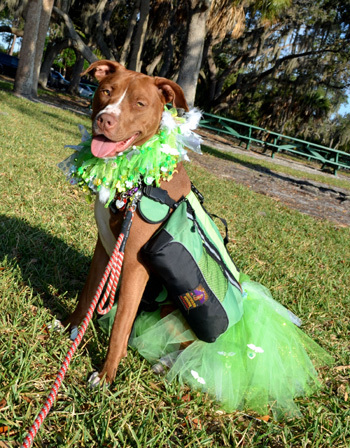 My Facebook friends recently helped me to win the “Pinup Super Hero” award for Pinup, benefitting Pinups for Pitbulls by voting for my pinup picture and donating to the cause! I even got a special invitation to the party! 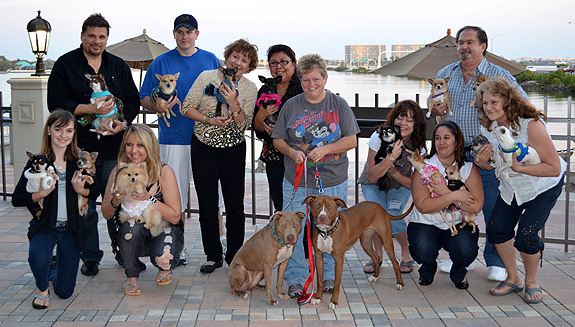 I have befriended the Chihuahua Meetup Group of Tampa Bay. This has been a slow and gentle process. We always see them at events, and I admire their beautiful dresses and decked out strollers. At first many were resistant to let me and Jade get anywhere near their tiny babies, but a few brave souls got out of their strollers to greet us. It is not uncommon to see us hanging out and even sharing treats with our glamorous little friends. We were even invited to dinner with them and that sealed the deal. We were so well behaved and gentle they couldn’t help but fall in love with us. At the end of the night I gave Miss Lynne the biggest pit bull hug ever to thank her for inviting us. A local organization, Save the Pitties, asked if I would donate blood to be used to save the lives of others, plus a donation is given to the organization to be used for medical care for rescue or shelter pit bulls. I gladly obliged! I was back full steam ahead the next day, better yet one of my Facebook friends, Suzi, saw that I had donated and made appointment that same day. Also, pit bull owners in other states were looking to find donation centers they could go to. Recently I was invited to the University of Tampa to be part of a presentation. Another Facebook friend, Alyssa, was inspired by me to do a presentation on breed discrimination and invited me to join her. I put on my best tutu and my WonderBull shirt, and Jade wore a patriotic sundress. Lexi, my foster sister, wore a tutu. Everyone was impressed how well behaved we were, and most were surprised to hear about breed-discriminatory legislation and its implications. We are very lucky to live in an area where I am free to go most places that other dogs go. I don’t have to be muzzled or shackled when I am out of my house. I have the opportunity to go out and show people what we are all about. Another endeavor I recently embarked on is Walk with Willow. Pack walking is such a fabulous way to socialize, exercise and bond with your human. We walk every Sunday morning, so we decided to announce where we will be so that our friends can join us. Many of friends are out of state and a few in different countries, so I have challenged them to start their own groups and to share their pictures and experience. That way we are all walking together! What I do is not extraordinary! I am a dog … a very lucky dog. I want all pit bulls to have my life – a life full of love and friends and walks in the park and Frisbee; a life where there is no fighting, baiting or forced breeding; a life where a family pet can not be taken and destroyed because of its breed; a life where puppies don’t need to be euthanized because there are just too many. I hope that what I do makes a difference. I hope that I can change the stereotype to what is should be. A pit bull is a fun loving and dedicated dog that only wants to please his or her people. Willow looks like my Krush. Awesome story! I am so happy to read about Willow today…all the bad news I have heard here in NM the last 2 weeks has me a bit fried and fired up, defending pitties to my mother and anyone else who will listen to me. Its nice to read a story about a great owner and a couple of great dogs, I really needed it this morning. Willow and Jade, you are beautiful souls inside and out. @trissi_v We are happy we could cheer you up today. If you are ever feeling down, please come to our Facebook page, where you will find a world of support for you and your pit bulls. We try to keep things as positive and upbeat as possible! We know there is bad out there but we want to show the “Good” side, the Fun side of life! Be careful ladies, information and understanding can be fatal to prejudice and discrimination. Pibble kisses are even worse. It is wonderful to hear your story! I am proud of your owner how is also an ambassador for Pit Bulls! @ElizabethSibus FischerThanks! My Mama’s work hard to make me look good! Training, Socializing, Fashion, Facebook and Events…..but they wouldn’t have it any other way! Willow you are wonderful. And your human mom and you are an inspiration. Love your outfits too. Thanks! Me and my Mama loves to help out anyway we can!